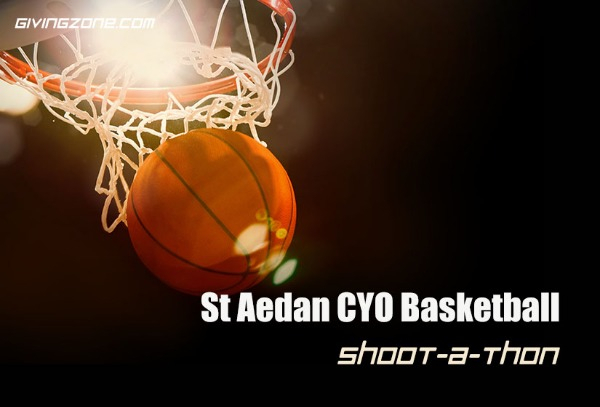 Saint Aedan CYO will host its team wide Shoot-a-thon on December 17th. During the event every athlete will shoot 50 free throws. We are looking for sponsors for each MADE free throw. You can PLEDGE anything from .25 cents to 10 dollars per basket made or make a one-time DONATION. Saint Aedan CYO will host its team wide Shoot-a-thon on December 17th. During the event every athlete will shoot 50 free throws. We are looking for sponsors for each MADE free throw. You can PLEDGE anything from .25 cents to 10 dollars per basket made or make a one-time DONATION. Please help us reach our goal! I know you will do great!! Best of Luck Buddy!!! Make me pay Gracie! Make me pay! Good luck. Way to go Pal !!! Good Luck Ava!! Love you! Let’s go Leah! Love you!! Good luck Jack, of course when you’re good you don’t need luck! Good Luck Bella! Love from Grandma & Grandpa! I better pledge $1a shot other wise you'd only make 10cents! We love you Katie.. good luck!! From Rita and Tom, great job Eric! Let’s go Shannon good luck! Go Julia!! Score big time!! You got this Seany boy!! Go gracie! Donating a total of $15 dollars just in case she makes one hundred baskets!! GOOD LUCK GRACIE - YOU CAN DO IT! Good luck!!! I love you! Go Ella and fill the basket! Hope you get sneakers named after you-Air Shannons! Go Alyssa....Happy to sponsor you. Good luck, Gia! We are proud of the great athlete you are becoming! Good luck!!! Sink lots of shots!!! Make those free throws Olivia! You got this! I know you can make all 50!! !